This entry was posted in Midd Blogosphere and tagged Midd Points on October 5, 2018 by Amy Frazier. This entry was posted in Midd Blogosphere and tagged Midd Points on September 20, 2018 by Amy Frazier. 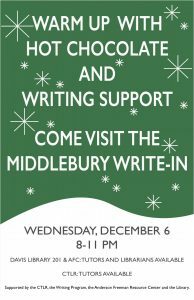 Tonight, December 6, 2017, we’ll be hosting the Third Annual Middlebury College Write-In, sponsored by CTLR, the Writing Program, Middlebury College Libraries, and the Anderson Freeman R esource Center. This event creates a one-stop place for students to get everything they need to hammer out those last papers in a fun and supportive environment. It’s like an academic writing party at the library! The Write-In will be happening from 8-11 pm at Davis Family Library, and 8:30-11pm at the AFC. Both Write-In locations will feature snacks, hot chocolate, writing tutors, a research librarian, and lots of moral support from friends. This event has been a great success the last two years, and we’re hoping to make this one the best so far! 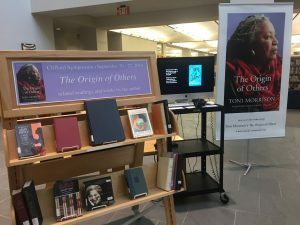 This entry was posted in Midd Blogosphere and tagged LIS Staff Interest on December 6, 2017 by Amy Frazier. It was a hit last spring, and so we’re doing it again: on Wednesday, December 7, the CTLR, the Writing Center, and the Library are hosting the second Middlebury Write-In! Students can attend at either the Davis Family Library or the Anderson Freeman Resource Center to find a productive, social, and supportive environment designed to help them focus on their writing. 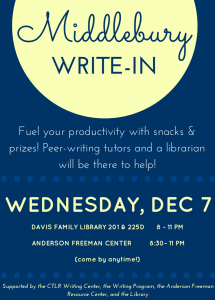 There will be food, prizes, and writing and research help on hand to make end-of-term writing less stressful and more fun. The Write-In begins at 8 pm and lasts until 11pm, but students are welcome to come any time! This entry was posted in Midd Blogosphere and tagged libspotlight, LIS Staff Interest, Post for MiddNotes, Post for MiddPoints on December 2, 2016 by Amy Frazier. 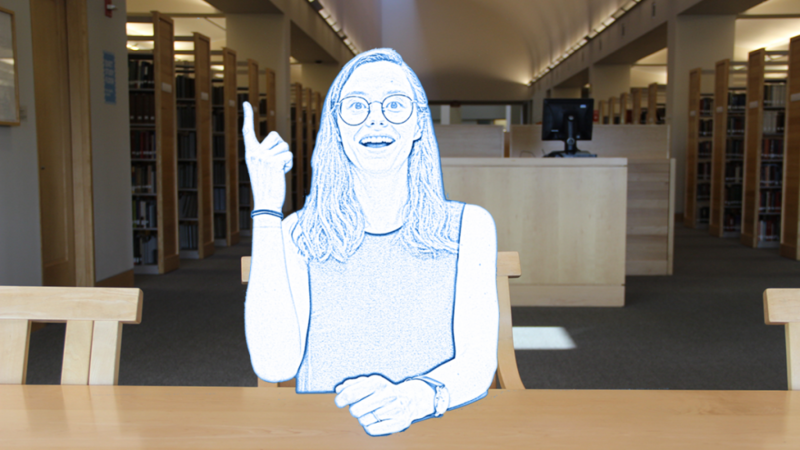 On Demand: streaming technology is revitalizing video as an educational tool in academia, but there are challenges ahead for libraries. 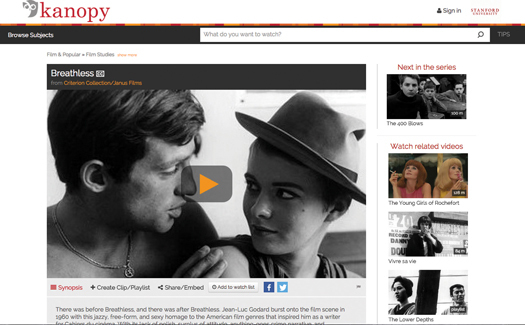 How some colleges are approaching the questions that streaming video raises. This entry was posted in Midd Blogosphere and tagged LIS Staff Interest on October 23, 2015 by Amy Frazier.